October 4, 2016 – Astronauts aboard the International Space Station (ISS) conduct research, fix equipment, perform space walks … and they vacuum. Although it has high-efficiency filters installed on all the air returns, the ISS, it turns out, is dusty, like any house, office or laboratory. The difference is that large dust particles settle by gravity here on Earth, but in space, they persist in the air. Anecdotally, eye irritation and other allergic symptoms have been reported by astronauts. To assess the magnitude of the dust issue, technology developed in part at Colorado State University could play a role in defining and solving the problem. A portable air quality sampler based on the TPS100 (thermophoretic sampler), a device developed collaboratively by Pittsburgh’s RJ Lee Group and CSU, will soon take a ride up to the ISS. The sampler is based on proof-of-concept work performed in the lab of John Volckens, professor of mechanical engineering and CSU Energy Institute researcher. The TPS100 is manufactured and sold by RJ Lee Group, an analytical microscopy company. The launch is slated for October 13 (subject to change). NASA will conduct a series of air sampling sessions in the American modules of the ISS to collect airborne particles, then return them to Earth for analysis and identification. 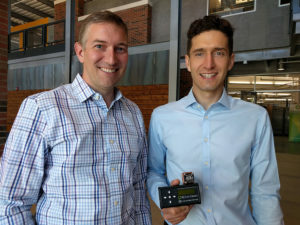 Several years ago, Volckens and CSU colleagues developed a prototype of a wearable TPS, originally meant for forensic-type analysis of human exposure to airborne particles. It was designed to collect nanoparticles – smaller than 100 nanometers across – but was versatile enough to capture particles up to several microns in diameter. Through mutual colleagues, Volckens connected with scientists at RJ Lee Group, including senior scientist Gary Casuccio, and they formed a partnership to develop a commercially viable product around the core discoveries of Volckens’ original research. CSU Ventures helped the scientists license the technology to RJ Lee Group, and the CSU researchers have continued offering technical and scientific support. The collaboration between RJ Lee Group and CSU resulted in the TPS100, a self-contained, compact nanoparticle sampler. This work was published in 2013 in Aerosol Science and Technology, and a patent was granted in 2015. During sampling, the TPS100 has an always-on pump that draws air through a heated channel and across a very small plate that is kept cooler than the heated air stream. Airborne particles migrate towards and hit the plate through a phenomenon called theromophoresis, and they stick there by van der Waals forces (the same forces that allow bugs to walk upside-down on a leaf). Dan Miller-Lionberg, who received a master’s in engineering from CSU, was the principal mechanical designer of the TPS100, and currently works half-time in Volckens’ lab and half for Volckens’ startup company, Access Sensor Technologies (co-founded with Chuck Henry, chair of the Department of Chemistry). Miller-Lionberg played a lead role in getting the TPS100 commercial-ready, including a user-friendly cartridge system for contamination-free switching of samples. For the NASA experiment, he designed a small fan attachment to keep the sampler cool, because things tend to overheat in space due to a lack of air buoyancy in zero gravity. The cartridges are later analyzed via electron microscopy. “Simply put, this technology is ideally suited to meet NASA’s needs for particle sampling and characterization in a lightweight, portable package,” Miller-Lionberg said. Casuccio said that among others, the National Institute for Occupational Safety and Health has expressed interest in using the TPS100 for information on dust and other pollutant exposure for workers. “One of the nice things about the sampler is that it collects directly onto an electron microscopy grid, so there is no sample prep required,” Casuccio said. Marit Meyer, the NASA scientist leading the air quality experiment, became aware of the TPS100 when she met Casuccio at an aerosol conference a few years ago. Meyer gave a presentation on a thermophoretic sampler she had designed for her spacecraft fire safety research. Her sampler was large and lab-sized, and optimized for larger smoke particles. The relationship with RJ Lee Group led to scientific collaborations. Then, an opportunity arose to propose a flight experiment, and Meyer approached Casuccio for particle sampling options. “The RJ Lee Group had an ideal sampler I was looking for in the TPS100: a portable collection device based on an operating principle that is compatible with low gravity,” Meyer said. The experiment is funded by the NASA Advanced Exploration Systems Life Support Systems Project, and takes advantage of commercial off-the-shelf technologies for select, low-risk challenges that hopefully lead to rapid, cost-effective solutions, Meyer said. With no aerosol instrument currently aboard the ISS, the air sampling project is a low-cost, low-risk experiment aimed at characterizing airborne particles, with the ultimate goal of informing the development of a permanent instrument that works in low gravity, Meyer said. Meyer noted that data on the size and nature of airborne particles on the ISS is limited to relatively large particles that have shown up in vacuum bags. Her hope is that the TPS sampler will give NASA a clearer understanding of the ISS’ air quality, with the goal of astronaut safety and wellness. To that end, the sampling experiment is designed to collect a range of particle sizes. The TPS100 can collect particles down to nanometer scales – 1000 times smaller than the smallest particles already identified. The experiment will last 32 days, and will include two TPS100 active samplers, as well as seven passive samplers, also designed by Miller-Lionberg and made by RJ Lee Group.